Here we have two Pierrots- one from Germany, the other from Japan, but both hailing from the 20s. The Sitzendorf porcelain pipe-rest dish has Pierrot reading a newspaper, as you do. Sitzendorf began porcelain production in 1760 and continues today; this dish has the double-crossed ‘S’ crown logo on the base, and is impressed with the no: 25044. Sitzendorf [or to give it its full title: Sitzendorf Porzellankfabrik Gebruder, Voight, AG] is now highly collectible. Next to the paper reading Pierrot is a citrus juicer- sadly missing its jug. Perhaps you have the jug? – It was made in a simple lemon or orange shape, with appropriate colouring. This Pierrot is handpainted, and is impressed with a ‘K’ on the base- encased in a circle of tiny dots. Klimax, a porcelain factory in Japan, is most well-known for its handpainted Samurai and Geisha tea sets, and lustreware. Despite missing its jug, the juicer is still quite functional and the two Pierrots together make for a nice art deco ensemble. 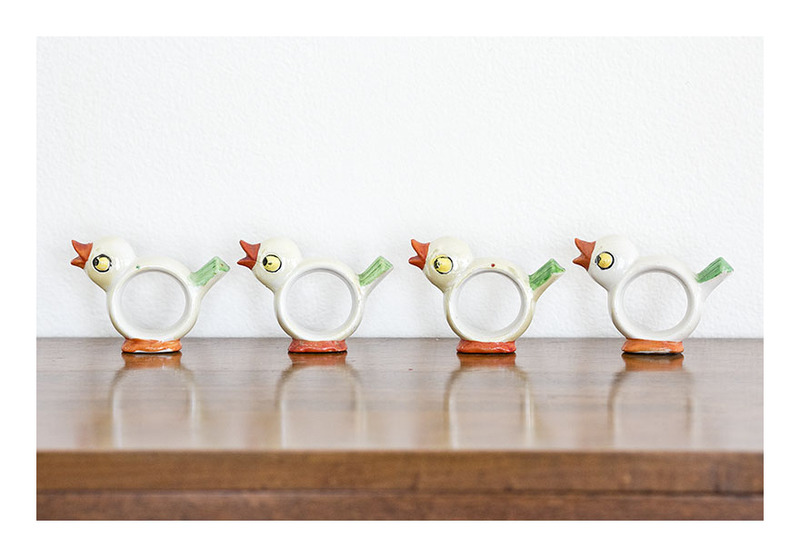 This is a fabulous set of art deco napkin rings; abstract bird-shaped, hand-painted and made in Japan. Vintage sets are increasingly hard to find – single pieces can sometimes be found but these four have always been together as a set. 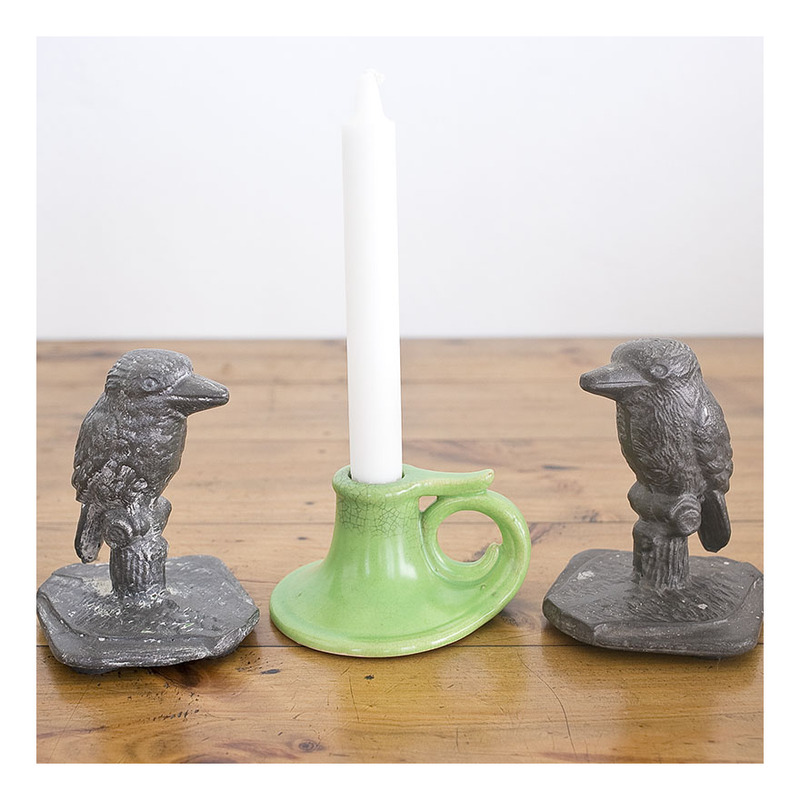 The colour of the hand-painted glaze and the condition is excellent; these ‘birdie’ napkin rings are ready to dress your vintage table. 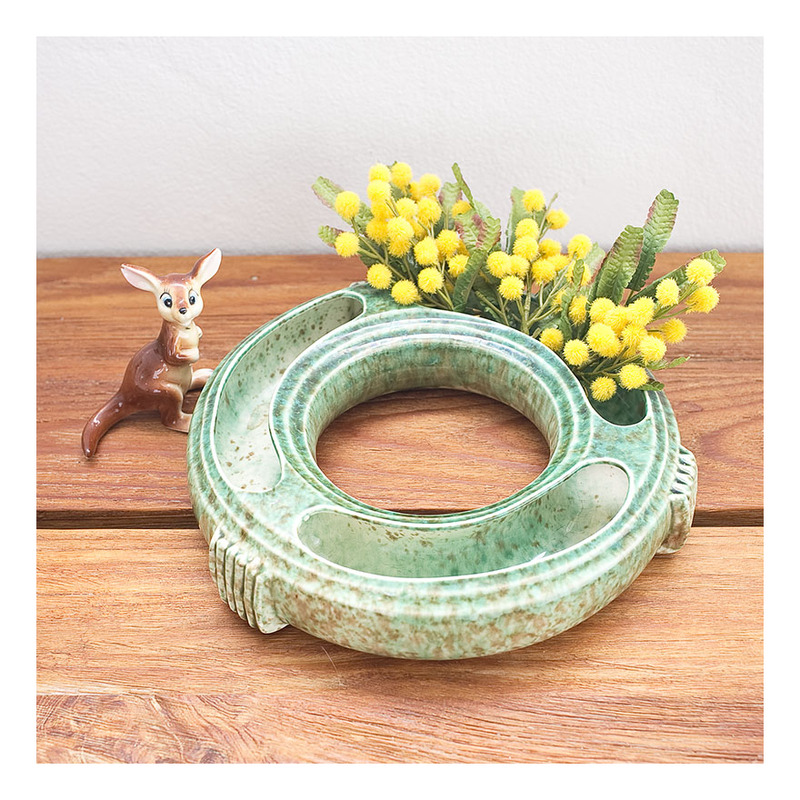 Following from the last post- here is an example of Pates Pottery that I collect- those with an ‘Australiana’ colour glaze of brown and green – apparently reminiscent of the Australian bush. This nationalistic colour combination was very popular in the 50s, and since I am a landscape architect, and quite fond of the Australian bush, I have tended to collect Pates pieces in this colour range. This quite deco-shaped vase has a removable ‘frog’ in the centre, in the same glaze. 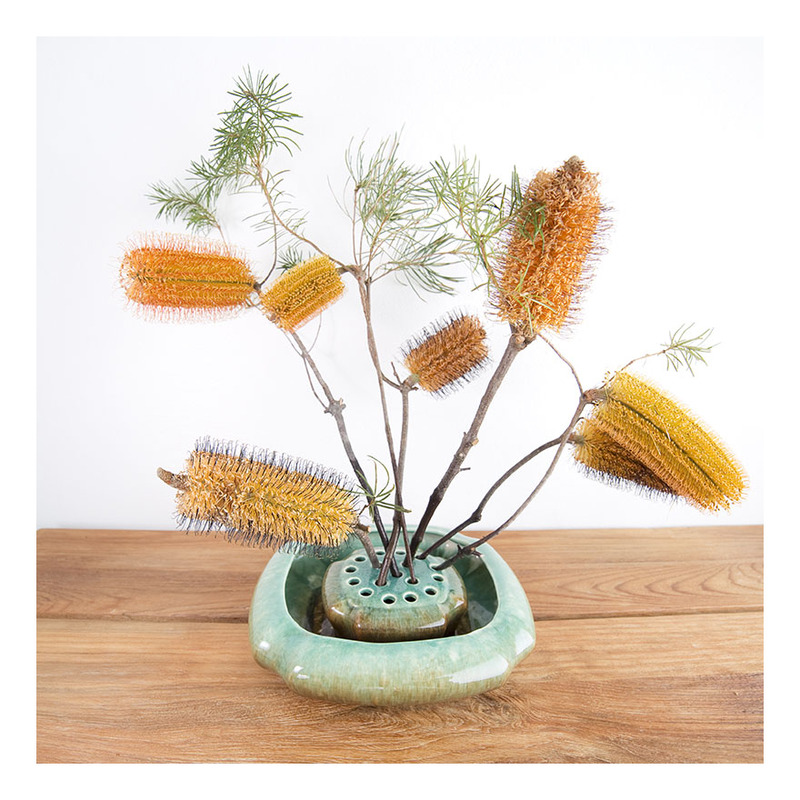 The frog is shaped with holes to support flower stems at the angle required…in this image I have attempted some free-form Ikebana, with Banksia flowers. That’s the great thing about retro vases- they lend a certain gravitas to one’s attempt at flower arranging! These beautiful vases were made by Pates Pottery, which operated out of Belmore, Sydney from 1946 -1990. As you may have noticed, given the tenor of the posts of this blog, being a Sydneyite I have an affinity for the potteries that were producing domestic ware in the 40s, 50s and 60s. 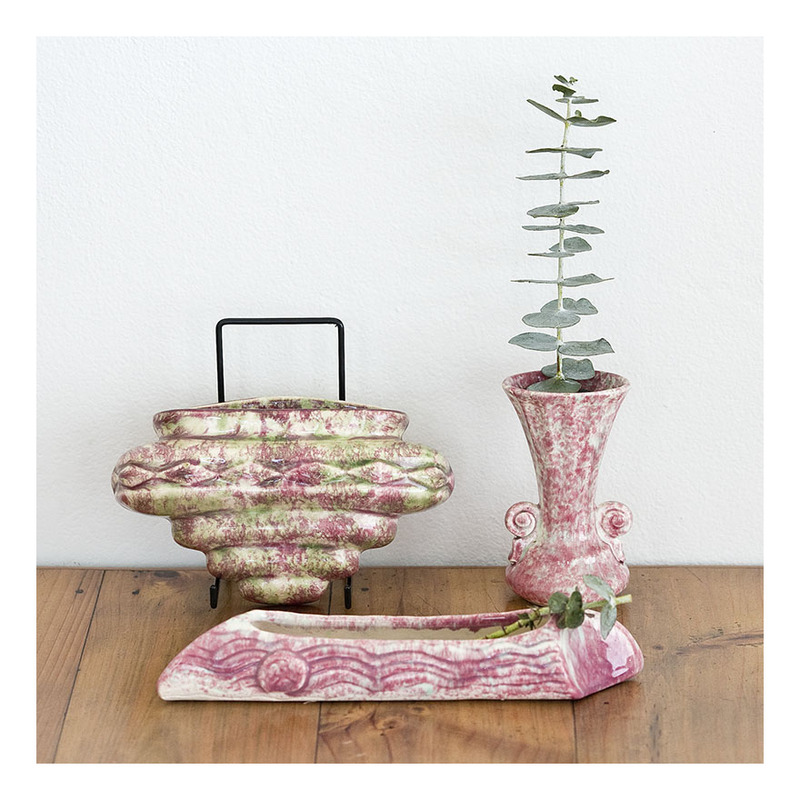 Pates’ glaze colours were influenced by the 1950s furnishing and domestic colour trends; the stippled pink and green is typical of this period. Also typical, but harking back to the Art Deco – are the forms and shapes of the pieces. Pates pottery had a foot in both camps- shapes that were very familiar but in colours that were funky and 50s. The three vases here are: Deco wall vase, posey ‘scroll’ vase and a stylized ‘log’ peony vase. All in top order and ready to receive flowers. I’m particularly fond of the wall vase- we don’t see enough of them in homes today- and it’s a great idea to hang flowers rather than take up table space.